The British Gazette » La plus ça change, la plus c’est la même chose. British politics are indebted in one way to American politics in that our American friends can often be far more direct – even brutal – at delivering criticism. 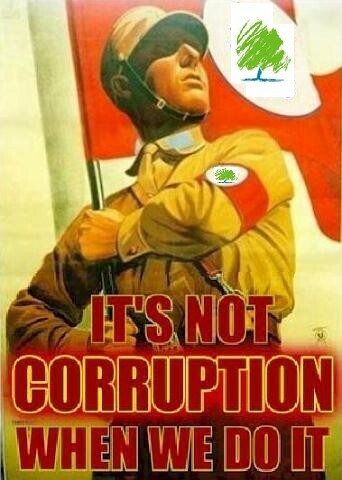 The famous Republican poster describing supposed Democrat corruption with its pictorial allegory with Nazism is not something you would see this side of the Atlantic – until now when it is used (the Democratic party’s logo being replaced by the Tories logo) by the British Gazette to illustrate its point. So too the title of this article, the phrase, La plus ça change, la plus c’est la même chose (More that changes, more it is the same thing) coined by the French critic, journalist, and novelist, Jean-Baptiste Alphonse Karr in the January 1849 issue of his journal Les Guêpes (“The Wasps”). As we approach the end of 2011 and look ahead to 2012, most commentators (political and financial) can see great changes ahead. It is entirely possible that the European political elite will manage to keep the Eurozone and European Union in existence until 2012 – we are after all three months away. However, the jury is very much out as to how much longer these constructs can continue after New Year’s Day, 2012. It is perhaps amusing to note that 2012 is also supposed to bring about “the end of the world” or some other great cataclysmic event. Those who believe that humanity (or most of it) will not live to see New Year’s Day, 2013 believe that the Winter Solstice on Friday, 21st December, 2012 will mark our global demise. This is because the Winter Solstice 2012 is regarded as the end-date of a 5,125-year-long cycle in the Mesoamerican Long Count calendar. Those adherents to the idea that the “End of Days” are approaching also point out to the prophecy of the Irish saint Malachy, the 12th century bishop of Armagh who made predicted a list of 112 popes until the end of the world. The present pope, Pope Benedict XV is the 111th pope. Doubtless should Pope Benedict XV pass away before December 2012, the doomsayers will go into overdrive. For myself, I do not ascribe to this nonsense, having said that, knowing how ironic fate (Sod’s Law) can follow me, were I to purchase a Euromillions lottery ticket for the draw on that Friday (21st December 2012), I can imagine the consequences; I watch the draw on TV (the Friday draws being televised at 10:35PM) the jackpot having rolled over many times and at its maximum of €185 million. I see the seven numbers come up and realise that I am worth over £150 million. In the following 85 minutes the end of the world takes place and I end up – along with everyone else – at the Day of Judgment. I will however be able to take some small comfort from one thing, Matthew 19:24 (And again I say unto you, It is easier for a camel to go through the eye of a needle, than for a rich man to enter into the kingdom of God) will not apply for I would not have had chance to make a claim! At least, that will be my defence! Seriously however, 2012 it is possible that the collapse of the European Union could take place in 2012 and that this year will mark the restoration of lawful government in this United Kingdom of Great Britain and Northern Ireland. Eurorealists and British Gazette readers will likely be highly delighted at this development, notwithstanding the immediate and very adverse financial and economic consequences attached to the EU’s demise. There is one thing however that all Eurorealists and British Gazette readers should be aware of: the traitorous and dishonest crew of Quisling perjurers will still be in post. This organ has fulminated (and will continue to fulminate) against the monstrous deception practised upon the British People by the Europhile elite vis-à-vis the UK’s membership of the EU and the monstrous fraud that is the Climate Change Con being perpetrated against them by the same. The British Gazette maintains that the above clause of dispensing with and suspending of laws and the execution of laws without consent of Parliament has been consistently carried out by these treasonous felons, as this is EXACTLY what happens when EU Directives are implemented. Our problem in 2012 will be that these treasonous felons will still be in post after a collapse of the EU. Do not think Dear Reader that these people will stop “assuming and exercising a power of dispensing with and suspending of laws and the execution of laws without consent of Parliament.” We will quote a hypothetical and topical example. Just let us suppose, for the sake or argument that a Mr Smith of Skegness had won this jackpot of £86,290,000 and that Anglea and Dave Dawes had ended up with £14,913,600 instead. Mr Smith a single man with few friends and family may have thought that he could buy a very nice house in Skegness for £600,000 and a very nice car for £60,000 (a Land Rover Discovery as it is British and there can be much snow on the east coast in the winter months). Assuming that he would want extra money for such as furniture and immediate holidays, Mr Smith calculated that £1,290,000 would suffice to improve his standard of living and that an income of £100,000 per annum after tax was more than sufficient for him. A quick calculation would inform him that £85,000,000 invested in UK income equity stocks would comfortably yield an initial 4.5%. This would mean an income before tax of £3,825,000 per annum! This he calculated – by the rough and ready division by two (50% tax on most of the income) – would be £1,912,500 per annum! An amount Mr Smith reckoned was way more than he could ever possibly need or desire. Mr Smith however was a generous soul and a reader of the British Gazette. Mr Smith valued his privacy and decided to ignore the British Gazette’s advice on not remaining anonymous as he was unmarried, had no girlfriend, had no children, and few friends. His only relative was a cousin in South Africa on whom he was not on speaking terms. However, Mr Smith agreed with the British Gazette in its opinion of the government of this country and decided that given that the country was being ruled unlawfully and Her Majesty the Queen was effectively a “State Prisoner” he would seek to structure his investments in such a way as to reduce his tax liability to the income he wished to use for his own comfort and maintenance and to see that the untaxed excess (which was by far the greater part of it) was given to the charities he supported. These were MacMillan Cancer, the British Heart Foundation, The Royal National Lifeboat Institution and the Royal British Legion. He therefore set up a company, St George Holdings Limited, registered in England with its registered office at the address of a chartered accountants in Skegness who were appointed the companies auditors. Desirous of keeping his anonymity Mr Smith appointed a nominee shareholder and also two nominee directors. His name and address therefore did not appear on the company’s records at Companies House. This is perfectly legal. The £85 million was transferred from Mr Smith’s bank account to the company’s and the amount used to purchase shares in numerous income growth investment trusts investing in the main in blue chip UK equities. Let us “fast forward” a year and in October 2012 the company’s accounts showed that it had received £3,825,000 in total income. It expenses was £3,825 (audit and administration and director and nominee fees). A dividend was declared that paid a mere £200,000 on which Mr Smith paid well under £100,000 tax. This left £3,621,175 in the company’s coffers. Rather than pay Corporation Tax on this amount Mr Smith had the directors send a cheque for £3,600,000 to a local firm of solicitors who undertook probate work and instructed them to pay £900,000 to each of the four charities. Question: Would Mr Smith get away with this? Why? You ask. Surely – you say – Mr Smith has done nothing illegal. He has used Company Law that gives a limited company a separate legal personality to enable the income to be distributed tax free to charity? That is what should happen. What would actually happen is that the civil servants in HM Customs and Revenue would ignore valid company law and arbitrarily decide to treat the entire income of the company as if it had been declared as a dividend and not given to charity! The civil servants would accuse Mr Smith of fraud. This however would be a severe calumny as fraud requires deception. There would be no deception. The accountants (who in reality of course would have counselled Mr Smith that such a policy was doomed to failure) will have prepared proper accounts. There was no dishonesty. This illustrates the problem we will have long after the European Union is history. A political elite that is arrogant and makes up its own ruled and interprets (should that be misinterpret) the law to suit their own ends. These treasonous felons are every bit as bad as the late King James II.